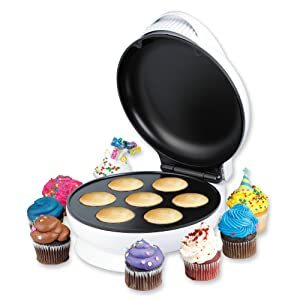 If you happen to have one of these mini cupcake makers, you can put a dollop of cookie dough in each of the cupcake spots and 11 minutes later – cookies. You may have to “pop” the tops on them at around 8 minutes. They usually bubble a bit. There was some highly scientific culinary experimentation involved in arriving at that 11 minute point. Earlier and they just fall apart; later and the cookies are pretty hard. Note we didn’t use liners, we just threw the dough right in. Oh, and they don’t turn out pretty. But tasty!